Xiamen, China, June 15 (CNA) Taiwan's Deputy Legislative Speaker Hung Hsiu-chu expressed the hope at the opening of the sixth Straits Forum on Sunday that Taiwan and China will cherish their increasingly close links and continue mutual dialogue and exchanges. She hoped that "with sincere dialogue and exchanges, the two sides will jointly inject new energy into cross-Taiwan Strait relations," Hung said in an address at the annual forum in Xiamen, which she is attending in the capacity of vice chairwoman of the Kuomintang. Hung touted the forum as a cross-strait event that "remains full of enthusiasm and vitality" even after a trade-in-services agreement between Taiwan and China sustained a setback in Taiwan, referring to a student-led protest in Taiwan against the pact in March and April. Describing the protest as a reflection of anxiety and problems in Taiwanese society, Hung said she believed the bumps in cross-strait ties could be smoothed over "through sincere and close interactions between the two sides and wise leadership from cross-strait leaders." Yu Zhengsheng, chairman of the National Committee of the Chinese People's Political Consultative Conference, stressed in his address at the opening ceremony that Beijing would continue its efforts to promote cross-strait ties in several areas. Yu said Beijing will continue to uphold its cross-strait policy of seeking peaceful development between the two sides, and promote "pragmatic measures" that will benefit Taiwanese people, without giving any details. The mainland will also not stop its efforts to boost participation in and benefits from cross-strait exchanges and cooperation, and not stop strengthening the foundation of public support for the peaceful development of cross-strait ties, Yu noted. "Peaceful development of cross-strait relations is closely linked to our common fate," Yu said. "Everyone should do more things that benefit people of the two sides, particularly Taiwanese at the grassroots level. Things that are not beneficial should be prevented," said Yu, an influential Chinese political leader. While stressing the importance of exchanges between the grassroots of the two sides to the peaceful development of cross-strait links, Yu also reiterated China's "one China" principle and its opposition to Taiwan independence. As long as those principles are not challenged, cross-strait relations will be able to stand on solid ground and continue to move forward, he said. 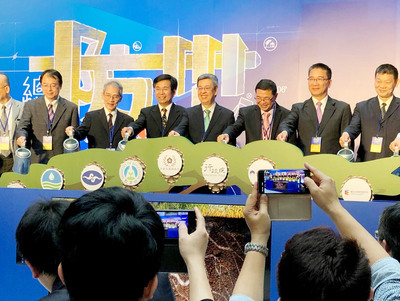 The Straits Forum attracted more than 10,000 Taiwanese representatives from various sectors, who will participate in 18 major activities taking place as part of the forum in different Fujian cities over the next week. The activities include a Matsu culture week in Putian, which is expected to attract more than 8,000 Matsu followers from Taiwan, according to online media reports in China. Matsu, the goddess of the sea, is widely worshipped in Taiwan. There will also be a forum for young people from the two sides that will enable them to exchange views and ideas on issues they care about. Other Taiwanese attending the forum are People First Party Secretary-General Chin Chin-sheng, New Party Chairman Yok Mu-ming, Non-Partisan Solidarity Union Chairman Lin Pin-kuan, and representatives of the 22 city and county governments around the country.